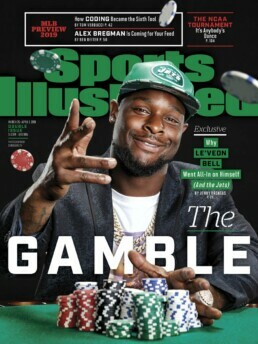 The first-ever NFL player to cover Sports Illustrated’s MLB Preview issue, New York Jets running back Le’Veon Bell sat down for an exclusive interview with SI to discuss his decision not to play during the 2018 season and how betting on himself paid off. The newly signed New York Jet talked the long road it took to get to his newly inked deal with the New York Jets. Despite being advised by TSEG agent Adisa Bakari to accept Pittsburgh’s first long-term deal valued at $12 million per year for five years, the two-time All-Pro and Steeler’s second leading receiver believed that his contract value should speak more to his production on the field; to the tune of $15 million per year. Le’Veon has now secured a contract that gives him a chance to earn $15 million per year and most importantly, sets a new mark for the most fully-guaranteed money for an NFL running back, with more than half of his contract value being guaranteed. , “People think, you are an athlete, so you’ve got your money—keep quiet and play. Yeah, I could’ve taken what [the Steelers] gave me and been quiet and been unhappy. But I chose not to. I wanted to be happy. I wanted to do what I felt was right and move forward. And now I’m here. And I wouldn’t think twice about changing it,”said Bell. By challenging the paradigm for what running backs are worth, Le’Veon has opened the door for other running backs to be compensated for their earned value.